Rome, 7 March 2017 – Leonardo and Milestone Aviation Group Limited (“Milestone”), a leader in helicopter leasing, today announced a contract for nine aircraft – six AW139 and three AW169 helicopters – expected to deliver in 2017 and 2018. The order, valued at €90 million, reaffirms Milestone’s commitment to the Leonardo “family” with an order book now consisting of AW169, AW139 and AW189 helicopters. General Electric Co. GE -1.32% on Monday agreed to pay $1.78 billion for the world’s largest helicopter leasing company, linking its interests in aviation and energy and highlighting a fast-growing specialty finance area that has attracted some of the largest names in private equity.The proposed acquisition of Ireland-based Milestone Aviation Group Ltd. gives GE access to the market for almost 2,000 large helicopters ferrying workers and supplies to offshore oil and gas platforms. The U.S. company’s engines power some of the new generation of rotorcraft costing as much as $25 million apiece that are coming into service over the next several years. The helicopter leasing business barely existed five years ago, but significant investment has helped sell out production for some machines until 2016. Operators are eager to secure more capacity and lower capital costs as they expand in other areas such as providing search and rescue services for governments. Houston-based Bristow Group Inc., BRS +0.08% one of the top three global operators, plans to expand its rentals to around a third of its fleet from a quarter at present. Milestone was founded in 2010 by Richard Santulli, an aviation industry veteran who also started business-jet operator NetJets Inc. With backing from the Jordan Co. and others, it amassed a $2.8 billion fleet of helicopters and placed orders valued at around $3 billion. Mr. Santulli will become chairman of the helicopter leasing business within GE Capital Aviation Services, or Gecas, and become a GE corporate officer. “There will be more interest in the sector, in what we are doing, simply because GE stepped in,” said Michael Platt, chief executive of Lease Corporation International Aviation Ltd., another Ireland-based aviation company that leases aircraft and helicopters. KKR Financial Holdings LLC this year also invested $100 million in LCI’s helicopter arm that has commitments in place to grow its fleet to 90 helicopters. Other entrants to the helicopter leasing business include Waypoint Holdings Ltd., backed by funds linked to Michael Dell and Soros Fund Management LLC, and Lobo Leasing Ltd., which is backed by Blackstone Group BX -0.95% LP. Babcock International Group BAB.LN +0.87% PLC in May bought Avincis SA, one of the world’s largest commercial helicopter operators, for $1.5 billion. The lessors’ growth has spurred demand for the big four helicopter makers— Airbus Group EADSY -0.18% NV, the Sikorsky Aircraft arm of United Technologies Corp.UTX -0.63% , Finmeccanica FNC.MI -0.58% SpA’s AgustaWestland, and Textron Inc.TXT -2.74% ’s Bell Helicopters as they introduce new models to satisfy demand for more modern and safer commercial rotorcraft that often have to fly long distances over water to ferry oil workers to rigs. The proposed Milestone deal, which is expected to close next year, comes as industry experts worry that growth in the airliner leasing business may stall. Cheap interest rates have funneled billions of dollars in new capital from private-equity funds and banks in China and Japan, depressing rental rates on some models as leasing firms compete for business. Another attraction of the business model used by Bristow and other operators is that two-third of their revenues come from fixed monthly fees paid by big oil exploration and service companies such as Total SA FP.FR -0.76% . The companies are paid whether they fly or not, and pass on fuel costs to their clients, making them more stable than commercial passenger airlines. The aircraft leasing unit of General Electric announced on Monday that it would buy the Milestone Aviation Group, which leases helicopters, for $1.78 billion. “The addition of Milestone will deepen our domain expertise in aviation and oil and gas, two critical G.E. industries,” Keith S. Sherin, the chief executive of GE Capital, said in a statement. The acquisition of Milestone, which is based in Dublin, is in line with GE Capital’s strategy of focusing on industrial businesses including energy, aviation, oil and gas and health care, while reducing its overall size by shedding other assets, mostly related to consumer finance, the statement said. Helicopter finance represents a fast-growing sector in aviation, according to the statement. Since Milestone was founded in August 2010 by Richard T. Santulli, a longtime aviation and leasing industry executive, and other members of the former NetJets executive management team, the company has grown into a leading helicopter leasing company. Milestone’s fleet now includes 168 helicopters worth $2.8 billion as well as a strong forward order and option book of $3 billion with a variety of helicopter manufacturers, the statement said. The helicopters in Milestone’s fleet are primarily used in offshore oil and gas, search and rescue, emergency medical services and mining, as well as other industries, and are leased to 31 operators in 25 countries. Mr. Santulli will serve as chairman of the helicopter leasing business and will become an officer of G.E. The deal is expected to close next year. “We are very bullish on the rotorcraft market, and on the future,” said Milestone Aviation Group managing director Robert Dranitzke. The company placed an exclamation point on that statement on the show’s opening day, as Milestone announced its fleet has grown to 143 helicopters valued at over $2.2 billion since the company’s founding in August 2010 and it placed eight new orders for Sikorsky S-92 medium-lift helicopters, which increased the company’s total of firm orders and options for the type to 37 aircraft worth $1.2 billion. The leasing company also holds more than $3 billion in firm orders and options from rotorcraft manufacturers AgustaWestland, Airbus Helicopters and Sikorsky. Today the company also holds $450 million in unsecured borrowing capacity, against a total revolving credit line of $800 million, thanks to what Dranitzke terms increased confidence from lenders. Dranitzke also noted Milestone’s ability to build a relatively large and diverse order portfolio–representing operators from the oil industry, EMS, law enforcement, and many other segments–has further encouraged investment in the rotorcraft segment. Most of Milestone’s 26 operating partners have signed multiple contracts with the company. It has been an incredible few years for Milestone Aviation Group. Since Milestone launched in August 2010, the helicopter leasing company has grown to become one of the industry’s biggest players. How big? At Heli-Expo 2014 in Anaheim, Calif., the company is announcing that it now has more than 143 aircraft valued at over US$2.2 billion in its fleet. That’s in addition to firm and option orders with AgustaWestland, Airbus Helicopters, and Sikorsky Aircraft Corp., delivering over the next five years, for more than 130 helicopters valued at over $3 billion at list prices. With 26 operating partners — including such industry leaders as Bristow Group and CHC Helicopter — Milestone now has helicopters working in more than 20 countries on six continents. Not a bad record for 42 months in business. Last year was a particularly active one for the company, which executed 10 new financing facilities also totaling $2.2 billion. These facilities tapped multiple markets, including bank lending, life insurance companies and the Export-Import Bank of the United States. Highlights included the first Ex-Im backed bond for the helicopter market, a $600 million secured revolver, a $200 million unsecured revolver, a $80 million PDP facility and a $575 million private placement with an investment-grade corporate rating from Kroll. All told, the company now has more than 40 financing partners. “We look for customers who are devoted to long-term partnerships,” Rosenthal explained, adding that when Milestone begins a relationship with a customer, “there’s no one better” at meeting that customer’s needs. “I think the market understands the different approach we take to our customers,” he said. Beyond its commitment to customer service, however, Milestone knows its market. The company’s rise to prominence has coincided with an increase in deepwater oil-and-gas drilling, which has driven demand for larger helicopters, such as the Sikorsky S-92 and Eurocopter EC225, that can carry more passengers farther offshore. Such helicopters are expensive, however, and even operators with hundreds of millions of dollars in turnover each year are coming to appreciate the flexibility that comes with leasing rather than buying. “A lease can extend their balance sheet and allow them to bid on tenders they otherwise might not bid on,” Rosenthal said, noting that Milestone’s growing order book allows it to offer customers near-term delivery positions for aircraft that are in high demand. While the company has made some significant placements in the search-and-rescue and emergency medical services markets — and has identified other opportunities for diversification in the future — Rosenthal said he expects oil-and-gas to remain Milestone’s primary market as the company continues to grow. Milestone’s growth has been so rapid that it is still feeling out the implications of its new position of influence (after all, the owner of the world’s largest fleet of S-92 helicopters will inevitably have some sway in the industry as a whole). While Milestone has been relatively quiet on industry issues thus far, Rosenthal said the company acknowledges that “growth has given us a seat at the table,” and is working behind the scenes to better understand operators’ needs with respect to technology and safety. The rarefied deepwater oil and gas market has spawned new players and big deals in the helicopter operating leasing market, but to date these transactions have largely been confined to medium and large helicopters. What will be the impact of leasing on the industry as a whole, especially for smaller operators with light helicopters in the non-oil-and-gas segments, and will it ever become as predominant as it is for airlines, where approximately one-third of the fleet is leased? The worldwide credit crunch and the trend for more deepwater energy exploration have created an environment for expansion of the leasing market, and new players–and some smart money–have entered the fray. These new rotorcraft leasing companies–Milestone Aviation, Waypoint Leasing, LCI Aviation, Lobo Leasing and Macquarie Rotorcraft Leasing among them–are promoting operating lease (an arrangement under which the lessor retains ownership of the helicopter), as opposed to financial lease, and are thus opening new possibilities for the operators to expand their fleets. Money has rapidly flowed into, and aggressive aircraft orders have been placed by, these new leasing entities: Milestone Aviation, as of September 30, had acquired more than 115 helicopters valued at over US$ 1.7 billion. It had closed leases with 25 operators in over 20 countries on six continents. It had raised $541 million of equity and $2.4 billion in committed debt financing. Milestone Aviation has placed significant orders–mainly for medium twins–with AgustaWestland, Eurocopter and Sikorsky. Milestone is now talking to Bell, according to managing director Robert Dranitzke. LCI placed an order for $400 million worth of AgustaWestland helicopters in 2012. Waypoint Leasing, capitalized with $375 million, made its first transaction in April with CHC and has placed a major order for several models of new AgustaWestland helicopters. Last fall, it announced that it had closed on a five-year $335 million (U.S.) revolving credit facility. Financial institutions involved include Credit Suisse, Goldman Sachs and Union Bank. Milestone was founded by NetJets creator Richard Santulli; Waypoint is backed by funds–hundreds of millions of dollars–from personal computer impresario Michael Dell and global investor George Soros; Macquarie is run by former Sikorsky CEO Jeff Pino. Perhaps reflecting past loyalty, Macquarie has already placed orders for new Sikorsky S-92s and S-76s. The smart money and minds are jumping into rotorcraft leasing for one simple reason: Often leasing is more lucrative than operating. Sometimes, even the operators know this. In September 2012, Bristow Group, one of the world’s largest OGP helicopter companies–it owns and/or operates 350 aircraft and its affiliates operate another 127–bought a $250 million minority stake in Canada’s Cougar Helicopters. The deal included the purchase of Cougar’s eight S-92s, which Bristow promptly leased back to Cougar and have been the source of revenue growth, according to Bristow’s latest quarterly report. Bristow is playing both sides of the leasing coin, buying and leasing helicopters to others while leasing helicopters for its own operations. Indeed, leasing has become an integral part of its business strategy over the last several years. In its form 8-K filed with the Securities and Exchange Commission in May 2012 Bristow specifically targeted operating leases as a strategy for “lowering the cost and amount of capital needed to grow.” Twenty-two percent of Bristow’s fleet, worth approximately $750 million, is leased and that percentage may grow; the company’s goal is to boost the total share of its leased fleet to 30 to 35 percent, according to its most recent financial filings. The strategy appears to be paying off: Bristow’s share price has increased from $48 to a high of $84 over the last 12 months and the company was able to fuel growth with an amazing $340 million worth of new capital expenditures over the first six months of the year, while at the same time boosting its overall cash position and improving liquidity. However, leasing is not cheap. Many lessors now require lessees to protect the value of assets by enrolling them in hourly maintenance plans with engine, avionics and airframe manufacturers; these are either add-on costs or part of the base lease rate. “Lessors recognize the costs to operate the helicopters, especially the engines and major components. To protect their asset value, one thing lessors like to have is a guaranteed maintenance program. It could be Power by the Hour on the engines, or in some cases tip-to-tail coverage,” said David Wyndham, president of aircraft consultancy Conklin and de Decker. For operators like Bristow, which need to buy ever more expensive helicopters to meet customer demand, leasing has become an integral part of their business strategy. The leasing companies can make large fleet purchases at a discount, further increasing their margins, while the OEMs can better predict demand in fluctuating markets–up or down. At last year’s Heli-Expo, Milestone’s Santulli cautioned OEMs against over-expanding production during boom times, counsel that meshes with lessors’ strategy of monopolizing production-line capacity during economic upswings. Milestone is partnering with Eurocopter on marketing its helicopter portfolio and offering customers the OEM’s parts-by-the-hour program. Banks have long offered financial lease services for helicopters. At the end of the lease period, the lessee–usually the operator–becomes the owner. Therefore, in the operator’s accounting books, the helicopter has to appear as an asset. What new players are offering is operating lease. In that instance, the lessor retains ownership of the helicopter. The operator buys a service, which appears in its results. “This is a major difference in accounting, as the helicopter no longer appears as an asset,” Fabrice Arfi, Eurocopter’s head of business development, explained. “For an operator, having helicopters on financial lease tends to have a negative impact on the balance sheet, reducing the capacity to get into debt and thus impeding growth,” Arfi said. Operators are eagerly expecting a way to improve their balance sheets. This is the need the new leasing players are meeting. “Some companies, even those with access to plenty of capital, understand the benefit of having a portion of their fleet [typically 20 to 40 percent] off balance sheet; this frees capital for other aspects of their business,” Dranitzke said. From the operator’s perspective, there is also the benefit of shifting the asset residual value risk to the lessor. “In addition, an operating lease generally allows matching the lease term with the underlying customer contractor length,” said Andrea Cicero, CFO of the Avincis group (better known under its Bond and Inaer brands). The cash-flow factor is important, too. “We start charging lease fees when the operating contract starts; this is different from buying a helicopter, where you typically have to put up a minimum of 15 to 25 percent of the aircraft’s capital value (the bank providing the rest) and start paying financial costs before you have an aircraft that generates revenue,” Dranitzke noted. Leasing can provide tax advantages to lessees as well. Lease costs can be amortized and deducted over the term of the lease and “leasehold improvements,” which could include engines, avionics and interior refurbishments, can be deducted up to 50 percent within the first year of placing the asset into service–an important consideration when leasing a used or incomplete “green” helicopter. The cost of other improvements can be recovered over longer periods. Additional fixed costs associated with the lease can also be deducted. By equipping operators to show they have aircraft available for the contract, the new leasing companies are enabling deals with oil companies that otherwise would not have happened. According to Bob Kokorda, Sikorsky’s v-p for sales, in the past, when a bank told an operator “You cannot take on more debt,” the operator had to pull out of competing for a contract. Some believe the 2008-2009 financial crisis helped spawn the new lessors. “With the credit crisis, other lessors such as us looked at the world differently,” Ed Washecka, Waypoint’s CEO, told AIN. Moreover, the industry has undergone changes in company management. Traditionally, the operators’ bosses were mostly pilots. This began to change in the early 2000s, when more MBA graduates took the helm. They learned the helicopter industry’s culture, Arfi said, and did not want to disrupt the way their companies were run…until the 2008 crisis. Then, they felt free to institute new fleet management methods, Arfi believes. Now, less than four years after pioneer Milestone Aviation started with the new model, operating lease agreements account for large numbers of helicopters. For example, Avincis has 24 aircraft under such terms. “We expect this number to increase to approximately 100 aircraft over the coming years,” Avincis’ Cicero added. According to Sikorsky’s Kokorda, Milestone owns about 50 S-92s, a combination of the ones it ordered directly from Sikorsky and the ones it bought from operators under leaseback agreements. Will other segments of the industry take advantage of operating lease services? Not all operators are convinced yet. Christophe Rosset, president of SAF Hélicoptères, an EMS/aerial-work specialist in France, told AIN that his company has chosen not to lease. “This industry is very capital intensive; when you have finished paying for a helicopter, you begin earning money or you can sell the helicopter for a good price,” he explained. Likewise, Air Methods CEO Aaron Todd told AIN at the start of the recent leasing boom that his company could attract capital for new helicopter acquisitions more cost effectively from the capital markets, as opposed to partnering with leasing companies. Air Methods is the largest helicopter EMS operator in the U.S., with 31 percent of market share and more than 400 aircraft operating in 42 states. It has grown in recent years through the acquisition of competitor companies and has embarked on an aggressive strategy of paying off aircraft leases that came with those transactions, spending more than $110 million in lease buyouts last year. The company says this strategy will reduce interest and depreciation expense. From the lessors’ perspective, the offshore oil-and-gas industry was the low-hanging fruit. Nevertheless, Eurocopter’s Arfi is convinced other segments of the industry will come round to the idea sooner or later. “Aerial-work operators are not finance experts yet but it’s just a matter of time,” Arfi said. Meanwhile, lessors will have to get out of their comfort zone and educate segments other than oil-and-gas. This may be the strategy for survival in an increasingly crowded market. Milestone’s Dranitzke said he would be happy to work with firefighting, pipeline surveillance and search-and-rescue specialists, providing the operator has a contract for using the helicopter. After oil and gas, EMS could be the next segment but the aircraft are smaller and less complex (and thus less expensive) and the fleets are smaller, according to Kokorda. Most attractive for lessors will be those EMS operators that fly relatively large helicopters on long-range missions such as hospital transfers, he said. Leasing to EMS would translate into orders for smaller aircraft. “There is a market for lighter aircraft; [in fact] we have a letter of intent for Eurocopter EC145s,” Waypoint’s Washecka said. He noted, however, that his company’s portfolio of light singles and twins is unlikely to grow large. It’s just as much work to lease an AStar as a Super Puma, he explained, but the light single is 15 times cheaper, making it more difficult to justify the time. The commercial helicopter leasing industry is still in its infancy, the agency said, but this doesn’t seem to have dissuaded Milestone’s institutional backers. To date, Milestone has attracted the financial support of global banking heavy-hitters such as Lloyds, Barclays and Lombard, the asset finance division of the Royal Bank of Scotland; and the U.S. Export-Import bank is backing the sale of $187 million worth of Sikorsky S-92s to the lessor. Expanding leasing downstream to light helicopters may in time drive sales to smaller operators, if they can meet lessor covenants, maintenance and other asset protection requirements. However, the parapublic markets might be more ripe for the taking, at least indirectly, as governments outsource traditional helicopter missions to private contractors such as Bristow, which recently landed a SAR contract in the UK, and the growing list of U.S. civil operators serving the U.S. Department of Defense. After just three years, Milestone Aviation Group is soaring in the helicopter leasing business. Co-founded and led by former NetJets Inc. CEO Richard Santulli and with its U.S. operations based in Columbus, the young company is expanding at a rapid pace, most recently closing on what it called the biggest debt facility for a helicopter lessor. Dublin, Ireland-based Milestone got its start with a $500 million private placement in August 2010, a year after Santulli stepped down from NetJets, the Columbus-based fractional jet ownership company he founded. Milestone buys new and used helicopters and leases them to a range of clients, including oil and gas producers, search-and-rescue agencies and medical services providers. The company, which runs an office in Colts Neck, N.J., has seven employees at its Arena District office. Milestone has made strides to establish itself in the industry, but none was more important than this month’s closing of a $600 million revolving line of credit. 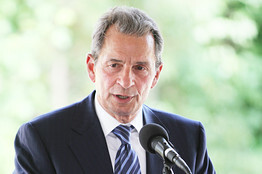 The five-year financing is a rarity for a company three years old, said President Daniel Rosenthal. The debt facility includes a revolving accordion feature that could expand the borrowing capacity up to $750 million, the company said. Milestone since 2010 has acquired more than 100 aircraft valued at more than $1.5 billion. It also has future helicopter orders and secured options valued at $2.2 billion. It has leased to 22 operators in more than 20 nations. In its niche, Milestone aims to move quickly when a customer needs aircraft, said Rosenthal, formerly executive vice president at NetJets. Offshore drillers have proven to be major clients. While aircraft makes up 3 percent to 4 percent of an oil rig’s production budget, “the other 97 percent is worthless without the asset,” Rosenthal said. “That’s where leasing has become more attractive,” he said of the industry. Milestone in July secured a $300 million credit facility to acquire and lease helicopters valued at $400 million to Houston-based Bristow Group, which provides the aircraft to offshore energy companies. A former Goldman Sachs principal, Santulli formed NetJets in 1984 when he bought Executive Jet, which got its start in Columbus in 1964. NetJets was acquired in 1998 by Berkshire Hathaway Inc.
Santulli was not available for comment. The company stayed close to its Columbus roots by partnering with Huntington Bank for financing, as well as for advice on debt, interest rates, foreign exchange and depository needs. Huntington played a big part in the $600 million financing deal, though it would not disclose specifics. For Huntington, financing the unique, high-cost industry is not viewed as an excessive risk, said Michael DiCecco, chief commercial officer and head of the equipment finance division for Huntington. Milestone Aviation Group has announced that it has secured a new $300 million credit facility that will enable the company to acquire and lease helicopters valued at US$400 million to affiliates of Bristow Group. The assets include the Sikorsky S-92, Eurocopter EC225 and AgustaWestland AW189 and AW139 aircraft. Lloyds Bank acting through its Corporate Asset Finance division was the mandated lead arranger and facility agent while Lombard, the dedicated asset finance arm of The Royal Bank of Scotland Group, and Barclays Bank served as original lenders for the credit facility. Milestone’s capital strategy is focused on developing diverse sources of funding to conservatively grow its business and best meet the needs of the helicopter community. The company has over $500 million in equity capital and has raised $1.8 billion in debt commitments from leading banks in North America, Europe and Asia as well as insurance companies and the US capital markets. The news of the credit facility follows the announcement that the company is supporting the growth of helicopter services provider, Blueway Offshore Norge, by financing the delivery of a Eurocopter EC225 to the company for change missions to offshore oil and gas platforms in the North Sea. Milestone leases EC225 helicopters to a number of operators throughout Australia, Brazil, Denmark, Norway and the UK. Milestone Aviation Group, the helicopter leasing firm headed by NetJets founder Richard Santulli, closed a new $300 million credit facility yesterday. The company will use these proceeds to acquire and lease helicopters–including Sikorsky S-92s, Eurocopter EC225s and AgustaWestland AW189s and AW139s–valued at $400 million to affiliates of Bristow Group. The credit facility is the largest ever for a helicopter lessor, the company said. In other news, Milestone financed the delivery of a Eurocopter EC225 to Blueway Offshore Norge, a subsidiary of Blueway. The Norwegian-registered helicopter will be used for crew-change missions to offshore oil and gas platforms in the North Sea. This European delivery is the first since the aircraft was cleared for a full return to flight, it said. To date, the company has 10 EC225s in its fleet portfolio, with these aircraft currently on lease to four operators. Milestone also has 30 EC225s worth $850 million on order, and these aircraft are scheduled to be delivered over the next five years, starting later this year.